Ancient Roman Baths : Ancient Roman architecture in action. based on written descriptions. Modern thermal baths. Note how similar the design is. This page is all about ancient Roman baths, how Italy became one of Europe's healthiest nations and what we can learn from Italian culture and traditions to make us healthier. Of all developed countries people from Italy live the longest - an average of nearly eighty-three years for women and seventy-seven for men. In Le Marche, that figure gets even better: eighty-four years for women and seventy-eight for men. So can we take lessons from Italy to make us healthier? What can we learn from Italy's excellent health record? There is an assumption in Italian culture that health care is both the right and the responsibility of every individual and there are two key secrets to good health in Italy: good Mediterranean food, and the forerunner of our health spas and leisure centres - ancient Roman baths. Whose bright idea was the culture of the ancient Roman bathhouse? Arched entrance to Caracalla baths, Rome. Centres of leisure, business, socialisation and gossip, ancient Roman baths resembled a rather less expensive version of modern spas and health centres. Initially built as a sort of private gym in the villas of wealthy Romans, their potential as public venues for the less well-off was quickly spotted by Emperors anxious to secure popularity. We know from excavations at the ancient bathhouses of Pompeii, which unearthed the original entrance fee box, that the cost of entry was a minimal fee of one 'quadrans' - the smallest coin denomination - and so the baths became part of the the daily regime for people of all classes. Mixed bathing is first recorded in the 1st Century A.D. but was condemned by respectable citizens. Although women went to the bathhouses, they tended not to exercise unless they were professional athletes but used them as a place to meet friends and share gossip. Evidence from Pompeii suggests that women would use the centres in the mornings while the men were working, men from early afternoon until sunset and children rarely if at all. As their popularity grew, men began to use the baths daily; indeed the Emperor Commodus liked bathing so much he is said to have visited as often as eight times a day. From their start in the 2nd Century B.C., then, ancient Roman baths grew in popularity and size as each Emperor tried to outdo his predecessor by giving the public more, bigger and better bathhouses. By the 5th Century A.D. they were an important part of ancient Roman culture and there were baths all over the Roman Empire - over nine hundred in Rome alone. 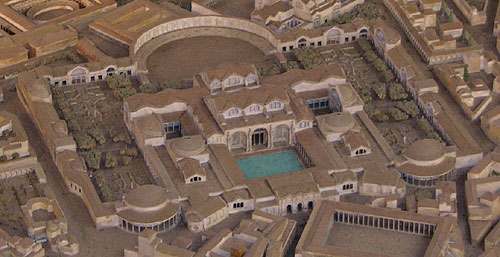 And the state owned ancient Roman bathhouses were not small; the Caracalla bathhouse covered more than thirty-two acres and is among the most imposing archeological complexes of the entire Imperial era. It could hold sixteen hundred bathers at once. Diocletian's baths outdid even that : they are known to have held up to three thousand people. Baths, aquaducts or toilets : which was the greatest of all ancient Roman inventions? Reality is that one could not exist without the others. 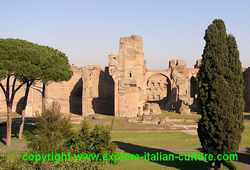 The Caracalla baths, for example, were fed by and reliant on the Aqua Marcia aquaduct from the hills ninety kilometres distant from Rome. Pipes carried the water under the surrounding gardens and into the bath houses where it was funneled into a complex distribution system feeding the cold pools. The entire bathhouse at Caracalla was built on a six metre (twenty feet) high raised platform to allow for pipes and furnaces under the building. 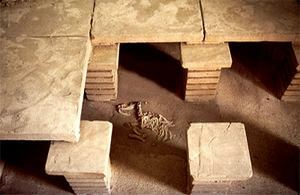 Excavations from Roman baths at Pompeii : heating system with floor in place and dog's skeleton trapped. Ancient Roman plumbing was one of the great achievements of the Empire and was put to good use in the bathhouses of ancient Rome. Huge furnaces stoked by slaves heated massive tanks of water which was then transported by clay pipes in an ancient version of underfloor heating. 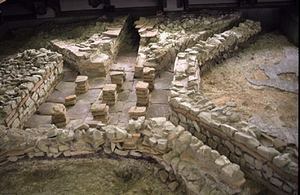 This 'hypocaust' system of heating used in Roman villas was also used in the baths; together with vaulted ceilings and cavity walls it ensured that heat was funnelled around the building and warmed the water. In an ingenious feat of ancient Roman architecture rooms needing the most heat were built nearest the furnaces and, when necessary, heat was increased by adding more wood. Consider that at Caracalla the hot room was a huge hall, one hundred and fifteen feet wide and with a pool three feet deep. In order to heat it it is estimated that there ere at least fifty large furnaces and there is evidence that providing enough wood to keep ancient Roman baths going led to serious deforestation in Italy. 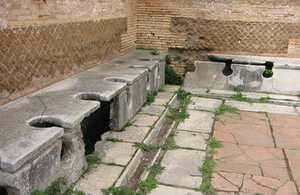 Public toilets were one of the great Roman inventions. All bathhouses had large public latrines which were, in effect, the first flush toilets. These toilets were an integral part of the plumbing system as well as another communal area in which to sit and chat. There was a continuous water flow underneath the seats, the whole being flushed away after use into the municipal drain and thence to the river. Women athletes used the baths to train. "The sturdy man does his exercise with lead weights. When he is straining hard (or pretending to) I can hear him grunt; when he breathes out I hear him panting and his hoarse gasps. Or I might hear ... the blows of the massager's hands slapping his shoulders. To all this, add ... the man who dives in with a lot of noise and splashing. And if a ball player comes along and begins to count his score out loud, I am definitely finished". The first aim of the ancient Roman bath house, then, was to promote health and cure medical conditions by providing gymnasia after the fashion of the Greeks. Weights, wrestling, ball games, running and swimming were all part of the regime. But the bath houses were also places of leisure in every sense of the word. Elaborately decorated with mosaics and marble, statues and wall paintings, the larger centres like the Caracalla baths in Rome are known to have had libraries - in Caracalla's case two separate libraries - and lecture halls for the more academic. For the less erudite the bathers were entertained after their exertions by jugglers, musicians, singers and poets. Food and drink were an important part of ancient Roman daily life and were equally the final part of the Roman bathhouse experience. The entire north wall of the Caracalla complex was devoted to shops. Seneca and Pliny both complained of too much alcohol being made available at the baths, and excavations have found not only fragments of cups, plates and jugs at bath sites, but tablets with price lists for nuts, cutlets, hog's fat, bread and drinks. Seneca - obviously not the greatest fan of ancient Roman baths - complains in his writings of the noisy shouting of the "cake and sausage men". Not the healthiest of diets, and probably not what helped Italians become one of Europe's healthiest nations. 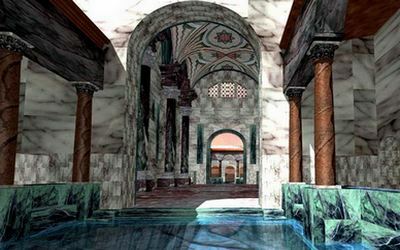 Ancient Roman baths : leisure centres, spas or water parks? A mixture of all three. Typically of the Empire, going to Roman bath houses was a ritual which followed a specific sequence of events not terribly different from our own leisure centres. Bathers would change into light exercise clothes, including special shoes necessary because of the hot floors, and store their daily clothes in cabinets - our lockers - which were then guarded by slaves. Sadly as in modern times thefts were rife; excavations have brought to light 'curse tablets' asking the gods to exact retribution on the thieves and Seneca, Catullus and Petronius all mention thieves in their writings about ancient Roman baths. Exercise came first, in a large central courtyard normally surrounded by a portico, or covered 'palaestras' or gyms where wrestling and boxing took place. The system from then on will be familiar to anyone who has ever been to a spa centre. First came a warm room, or 'tepidarium' (hence the English word 'tepid') where the sweat and dirt of exercise together with the oil applied beforehand was scraped off and a massage might take place. Oils formed a part of every Roman's gym kit for use both before and after exercise. A large hot bath came next, always with a great heated pool open to the skies and with mirrors overhead to reflect sunlight into the pool. This was then followed by a steam room - particularly unpopular with Seneca who, killjoy as ever, felt that sweat should be earned by hard work rather than sitting idly about - and finally the cold room or 'frigidarium' which would contain a smaller plunge pool. Godliness - the final stage? Sulis Minerva found at site of ancient Roman baths in England. 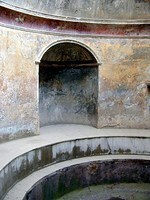 Some Roman bath houses were built on the site of natural hot springs known for their healing properties and it is clear from both writings and the many votive offerings found in excavations that the water, often as hot as forty-six degrees Centigrade, and the healing were thought to be the work of the gods. And so some ancient Roman bathhouses became sacred places and temples were built either on the site or very close to it. 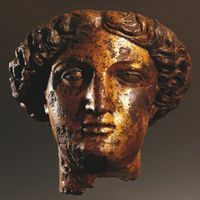 Most notably in Bath, U.K., votive offerings including over twelve thousand coins were found on the site known to have been a temple dedicated to the goddess Minerva which was an integral part of the Roman bathhouse complex. The temple at Bath was a magnificent feat of ancient Roman architecture, standing on a podium more than two metres above the surrounding courtyard. Approached by a flight of steps, there were four large, fluted Corinthian columns supporting the decorated pediment above. In the later second century the Temple was modified by the addition of small side chapels and the construction of a promenade area around the outside. Most ancient Roman baths, however, were places of entertainment rather than worship. 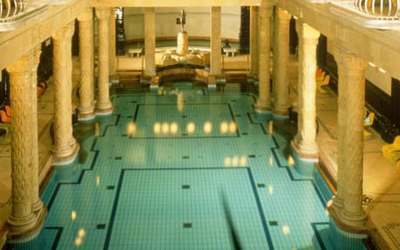 The opulence of the baths embodies the essence of a culture that thrived on pleasure and leisure. 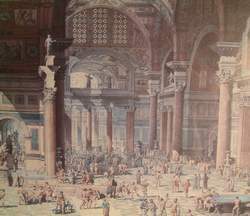 Writers frequently comment on the beauty and luxury of the bath houses with their rich furnishings, brightly coloured mosaics, paintings, marble panels, and silver fittings. Christians and philosophers denied themselves the array of pleasures available at the baths and denounced them as 'Cathedrals of the Flesh'. Ancient Roman baths or modern leisure spas : the same or different? Italians take their leisure and their health very seriously. Sport is as important a part of Italian culture and traditions today as it was for their ancestors, and a massively important part of ancient daily life was Roman bath houses. The word spa itself is a Latin acronym : 'sanus per aquam' or 'health through water'. Although public baths existed in early Egyptian palaces and bathing occupied an important place in the life of the Greeks, it was the Romans who developed the concept of bathhouses to such a highly sophisticated degree. Roman bathhouses were among the most expensive of ancient Roman buildings and made the kind of splendour usually associated with royal residences accessible to all. The bathhouses fulfilled as many functions as spa resorts do today - they were and are social, recreational, cultural and health centres rolled into one. Enjoyed by everyone, even Cicero had to admit that "the gong that announced the opening of the public baths each day was a sweeter sound than the voices of the philosophers in their school." So did Italian health care start here? Built wherever the Romans made conquests, archaeologists have discovered Roman spas of monumental proportions throughout Europe and North Africa, the most recent found in 2008 in southern Siberia. There are one hundred and eleven major thermal spa resorts in Italy today (source : Italian Government Tourist Board) spread throughout Italy from the Veneto and Lombardy in the north to Tuscany and Lazio and to Sicily in the south. Many are built on the site of ancient Roman baths, among them Montecatini, Saturnia, Chianciano and the natural spa of Ischia with its twenty-nine warm springs and over one hundred spas. For many contemporary doctors, thermal cures remain an alternative medicine and wellness spas today offer complete services for psycho-physical wellbeing in exactly the same way as the ancient Roman baths did. Business can be combined with relaxation, helping body and mind cope with the stresses of the modern world, and minerals in the waters are believed by many to cure physical ailments. Their popularity is irrefutable, the feeling of wellness they bring indisputable. And for that, we have ancient Roman baths to thank. There are remains of ancient Roman baths throughout Europe and North Africa. The bathhouses at Bath in the UK are particularly well preserved and can be visited online at www.romanbaths.co.uk. In Rome, the Colle Oppio park behind the Colosseum in Rome contains the remains of the Trajan baths. The site of the frigidarium of Diocletian's baths was used to construct the Church of Santa Maria delli Angeli near the Piazza della Repubblica and what was the main hall now houses part of the Museo Nazionale Romano (National Roman Museum) and contains many of the sculptures and mosaics taken from the baths. The museum is open each day apart from Monday. 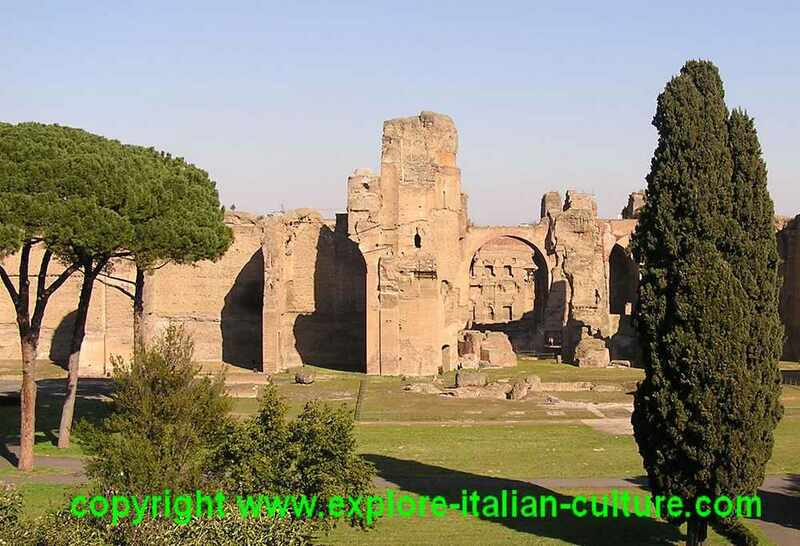 But the largest and most famous ruins of ancient Roman bathhouses, and those giving the best impression of the size and grandeur of the original bath houses, are to be found at Rome's Caracalla baths. There are not normally long queues to visit and the site has the advantage of full facilities for persons with disabilities. It can, however, be very hot in the summer - take a bottle of water. Via delle Terme di Caracalla 52 (south of the Roman Colosseum). The baths can be reached from metro line 'B', alighting at the Circo Massimo station. Alternatively, take bus route numbers 11, 27, 90, 90b, 94, 118, 673; or trams numbers 13, 30, 30b. Caracalla is open every week on Monday mornings from 9am to 1pm and from Tuesday to Sunday from 9am until one hour before sunset, public holidays excepted. Looking for things to do in Rome? Try the Caracalla Baths! This is a spectacular setting and well worth going if you can get a ticket. Book early as performances are limited. 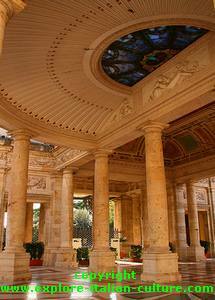 The box office is at Piazza Beniamino Gigli, Rome, or your hotel concierge will be able to help. A stunning setting for opera in the summer - the Caracalla baths. Want to know more about other ancient Roman buildings? Images of ancient Rome on this page, unless otherwise specified, are courtesy of the V-Roma project.